Eight Easy Steps to Create a Personalized Closet! Hi Ladies! I’m excited to share Eight Easy and Practical Ways to Create a Personalized Closet! The most important thing to remember is that you are the Designer. I will provide you with tips and ideas, but you must implement them so that you create a wardrobe that’s wearable and that you love! I recently shared that the first secret to Stop the Impulse Shopping was to do a wardrobe inventory. This is a “must-do” project before you head out the door to do ANY shopping! It will stop the impulse to buy things you don’t need! Here are eight steps you need to do to discover what you already own, what fits you well, and is the best color for you. If you haven’t worn an item in the last year, it’s the wrong color, you don’t like it, or it doesn’t fit then you need to get rid of it. If you haven’t worn an item in the last year because it doesn’t fit but you are confident that you’ll wear it one day ( the color looks great on you), take it out of your closet and place it in a storage bin with the size written on the outside of the box. If you are a size 12, for example, and you have size six, eight, and ten, organize them by different sizes and put them in a separate storage box and store them in a different part of your home. If you have special occasion items that are worn once a year or less, move them out of your regular closet. When you have eliminated the items that are taking up space, you can begin checking the remaining pieces to ensure that they are the right color for you. 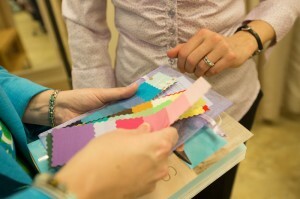 You can do this by matching your color swatches against each piece. If you don’t have swatches or you’ve never had a color analysis, you can go to color e-analysis for a free analysis and order your personalized color swatches. Try on all the remaining items that you’ve worn in the last year to ensure that they fit well. Do this with items that you may not be certain about. Keep or remove items according to the instructions above. Check each item for repairs needed, if it needs to be dry cleaned or washed, or if it needs alterations. Place these items in separate piles. Now you should have a pile clothes left that fit well, are your best color, and that you love to wear. These are the items that belong in your closet. Organize your closet according to color and style. Take all your pants and group them together according to color, length, etc. Do the same thing with your skirts, blouses, dresses, and so on. Now begin taking a quick inventory of the items that you have. Do you have more bottoms than tops? Could you use more dresses, skirts, and blouses. Start making a list of the items you need to purchase. Follow these steps for your other storage areas such as your shoes and drawers. 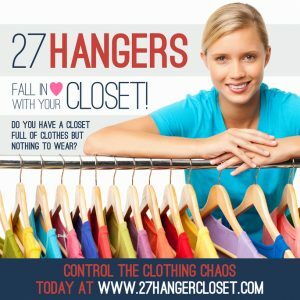 Now that you’ve eliminated items and reorganized your closet, you are probably feeling accomplished and tired! But DON’T get discouraged! This is where the FUN begins. Now we can begin our treasure hunt to find the items you need and that add personality to your closet and appearance. If this project feels overwhelming, I’d love to work with you personally to create a designer wardrobe. I can be contacted at lynnae@lynnaebussell.com. Next time I’ll share the 12 Basic Pieces for a Great Wardrobe! Let me know if you have comments or questions.